Hrafnkell Sigurdsson is born in Iceland in 1963. He studied art at the Icelandic College of Arts and Crafts in Reykjavik and later at the Jan van Eyck Academy in Maastricht in the Netherlands. In 1993 he moved to London where he studied and worked for eleven years. Since 2004 he is based in Iceland and works on his art. 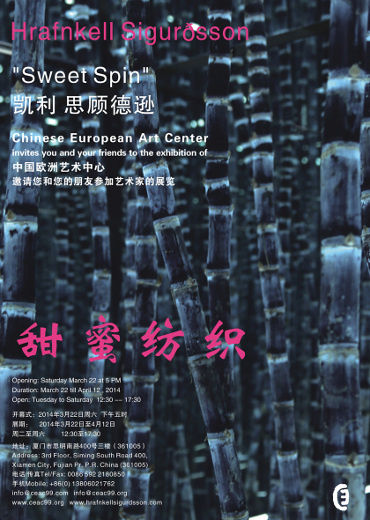 At this moment he is doing a three months residency at the Chinese European Art Center (CEAC) and has made the works in this exhibition during his stay here in Xiamen. Hrafnkell has had numerous exhibitions in Iceland, where his work is well known and highly appreciated, as well as in many other countries in the world. He is best known for his photographic work but has in the last few years made installations of his photo and videos. Even though most of Hrafnkells work appears to us in the form of photographs he is not a photographer. The photos we see by him are never dealing with the phenomena photography but rather more they are windows into a world that we see through his photographs. It is that world that makes the work his work. His photo works are just a neutral window, which leads us to his real work. No wonder that he likes to use installations that take us through the window as near as possible to experience his real work. In this exhibition, named ‘Sweet Spin’ we are confronted with a world, which is an illusion of space where the artist takes us into a mental space that we cannot see in our every day life. He says, ‘This work started of as a completely different idea, but I had decided to keep an totally open mind during the process. I feel that this openness allowed the spirit of the nature here to enter into the work. I myself am surprised and excited by this experience, which Xiamen has given me’. The sugar cane sticks which he uses in this work are, like always positive, sweet and good and natural and full of good energy. They are placed here in vertical positions – coming from the deep dark soil reaching into the infinity above. Like all artworks this work is telling a lot more than we can explain. Hrafnkell Sigurdsson says about this work: ‘I have a strong feeling that I have been CREATING a kind of a mental space or better said a soul space which lives inside of me’. Courtesy of the artist and Chinese European Art Center.